Panera Bread is a chain of bakeries and cafes which sell bread, pastries and other baked goods, as well as prepared sandwiches, soups, salads and other restaurant faire. It’s comparatively expensive, but uses high quality ingredients and thoughtful preparation which puts it above fast food. For my first review, I decided on a panini. Not this exact panini per se, but one very similar. My selection, the Turkey Artichoke Panini, was delicious. The turkey itself was decent, deli sliced but a generous amount, but the other elements were really the stars of the show. The carmelized onions, artichoke spread, and Asiago-Parmesan cheese converged into a full, flavorful taste. The sun-dried tomatoes were alright (in my opinion, sun-dried tomatoes are one of the most overrated sandwich ingredients), and the foccacia it was served on was tasty and large. 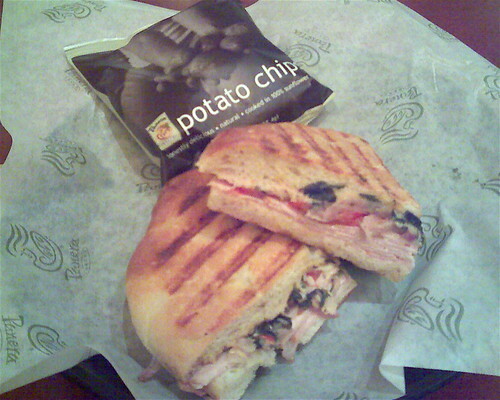 The sandwich was also served with Panera brand chips, which were pretty good as well. The only downside of this sandwich was that it cost $7.09, and didn’t include a drink. It was among the more expensive sandwiches on the menu, but even the cheaper ones ran for around $6.50 and up. A full meal at Panera would probably cost around $10. I’d definitely recommend this sandwich from a taste perspective, but from a cost standpoint it’s a bit overpriced. 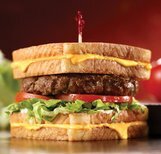 Seemingly in an effort to top KFC’s recent abomination the Double Down, family restaurant chain Friendly’s has introduced the Grilled Cheese BurgerMelt, a large hamburger served between two piping hot grilled cheese sandwiches. Yes, you read that correctly. Apologies for the small picture, but you get the idea. "What they did to me was monstrous." "And so they created a monster?" In addition to the burger, the sandwich includes lettuce, tomato, and mayo. I honestly cannot imagine how this could be any good. I have nothing against the use of toast in a sandwich or burger, but using an entire sandwich as a bun is far too much. The entire affair looks so unbalanced and unappetizing. Unfortunately, there are no Friendly’s in Michigan, but I promise if I somehow end up at one, I’ll try this sandwich, so you don’t have to. Meanwhile, let’s muse for a moment on what the next entry in this race to the bottom will be. A burger with slices of pepperoni pizza for buns? A sandwich using miniature chicken pot pies in place of bread? The possibilities truly are endless. Another of Arby’s Market Fresh offerings, the Steakhouse Sub is a variation on their usual roast beef sandwich. 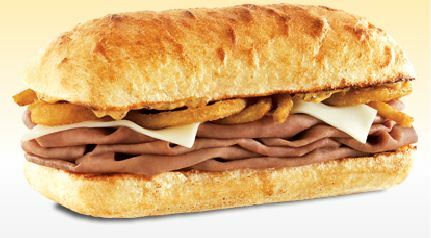 In addition to the roast beef, the sub includes swiss cheese, crispy onion straws and a cracked peppercorn sauce, all toasted on a ciabatta roll. I’m not exactly sure what makes it a steakhouse sub, what with it being roast beef and all, but that’s beside the point. The sub is actually pretty good overall. As always, Arby’s roast beef is delicious, and the onion straws are an interesting choice. The cracked peppercorn sauce wasn’t as “zesty” as I expected, but I felt that actually worked to the sandwich’s advantage, as it complemented the cheese well. My main complaint was that the roll was closer to burned than toasted, which kind of took away from the experience. All in all, the Steakhouse Sub was a worthwhile buy, not quite as good as their Philly Beef, but worth trying while it’s available. Wendy’s is known for its high quality burgers, chicken, chili, and frosty desserts. The tradeoff on this is that Wendy’s is usually a bit more expensive than its competitors, with its new menu items going for upwards of 4 or 5 dollars. In an effort to stay affordable, Wendy’s has introduced two new value meals, the BBQ Bacon Double Jr. Cheeseburger and the BBQ Bacon Crispy Chicken Sandwich. Spot the differences between these two pictures!!! The sandwiches are actually pretty run of the mill. These days, it’s hard to market barbecue sauce or bacon as a hook in and of themselves. That doesn’t make these sandwiches bad. On the contrary, if you’re going to get a BBQ Bacon sandwich, these are a good bet. They also feature onions, pickles, and American cheese, a tasty combination with both chicken and beef. These sandwiches are good, but what pushes them into “great” territory is the price. A small combo, consisting of either sandwich, fries, and a drink, is only $2.99. In this economy, most people aren’t willing to splurge on a 6 or 7 dollar fast food combo, no matter how many times you name drop Angus beef or Chipotle sauce. These tried-and-true flavors are definitely worth it. Breakfast sandwiches haven’t been discussed on Sandwichtalk yet, mainly because I have a hard time making it out to a restaurant before the 10:30-11:00 changeover to the lunch menu. However, now that Sandwichtalk is nearly a year old, I want to branch out a little bit, and what better way to start than with one of the strangest breakfast sandwiches around, the McGriddles? Not a hoax!! Not a dream!! The McGriddles (yes, the ‘s’ is part of the name) is a McDonald’s breakfast sandwich which includes scrambled eggs, american cheese, and either bacon or sausage (they also serve a sausage-only variant). What sets it apart from other sandwiches is the bun, a pancake-like creation with maple syrup flavoring baked in. I was as skeptical as any of you, but in the name of Sandwichtalk I decided to try one. I had the Bacon Egg and Cheese McGriddles. 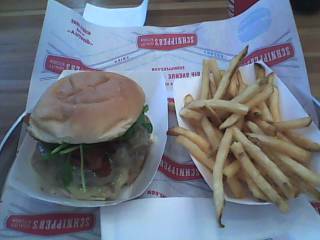 It was actually quite a bit smaller than I expected, but that didn’t keep it from being delicious. The buns were sweet, but more subtle and less processed-tasting than I expected. It may seem counterintuitive, but think of it this way: people have been eating eggs, meat and pancakes for centuries, this just takes a few extra steps out of the process. I think the sausage McGriddles might have complemented itself better, but I’m a sucker for bacon, and I don’t regret it. Overall, a pretty good, relatively inexpensive breakfast. Obviously, it’s got a lot of sugar and fat and whatnot, so I wouldn’t recommend it on a daily basis, but try it once in a while to shake up your morning routine.